BSG’s Ron Moore Speaks!! We discuss the Battlestar Galactica, Crappy Video Games, iTunes, Razor, Strike, DVDs and more! 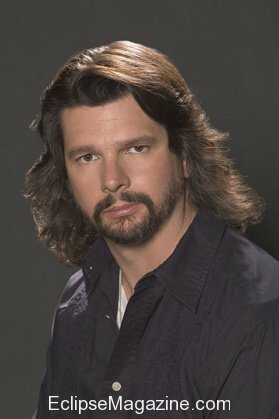 Since I’ve been such a good little whore for all things Galactica this month, the folks at Universal gave me 1 hr, today, to come up with some questions to ask the great Ron Moore, creator/producer of BSG. So I shot these over to one of my contacts and he got Moore to answer, the interview went a little something like this. We talk about the Strike, Razor, Lesbianism and more! Be sure to check out our Razor DVD Giveaway! This is an EM Exclusive. 1) What was the genesis of the idea to do Razor? It came from Universal Home Entertainment. They had an idea of releasing a video version of Galactica in the fall. It had done well on DVD in the release of its seasons. We weren’t going to broadcast season four until spring of ‘08, so it made sense to have a BSG release in the fall. They would broadcast it once on Sci Fi and release it within a week on DVD. It quickly came about. We ended the third season on a cliffhanger, so that didn’t make sense to tie that in – we had to go back in time and do a story before the cliffhanger. We decided to revisit some aspect of the Pegasus/Admiral Cain storyline and see the original attack on the colonies and from Pegasus’ point of view with the original Cylon attack. The writers kicked around story ideas and went through it at my house. We have 10-15 minutes more on the DVD, including young Adama and the first Cylon War. There is more footage with young Helena Cain as a child during the first Cylon War, plus extended version of other scenes. It doesn’t predate the series. It just happens to take place around the original Cylon war – it skips around chronologically. 2) How do you see Razor fitting into the overall BSG mythology? It fleshes out events referred to previously. You see the first mission that Lee gets when he takes command of Pegasus. It’s a broadening of stories in the series. 3) There’s a pretty big spoiler about Kara at the end of Razor, can you talk a bit about it? We were looking for information that we put in Razor that changes the audience’s expectation of that storyline. We darken that – could be a positive or dangerous element. We won’t know until season four. 4) How do you feel about the rumor that Sci-Fi is going to split the final season into two seasons? It is under consideration. The writers’ strike is complicating everything. Even before the strike, we didn’t know. There will definitely be a break between the first half and the second half. The season was designed with a midseason cliffhanger. 5) It doesn’t feel like it’s real, more like a stunt to “artificially” stretch the show for another year and charge loyal fans for extra DVDs. 6) Blu-Ray or HD-DVD and why? I am avoiding both – I am a skeptic until they settled on one format. It’s not worth my time or effort until then. 7) Since BSG isn’t scheduled to air until next April, how does the current strike affect what you are doing? The shows that start in April are already in the can. We started shooting in June and have finished 10 weeks worth of shows. 8) What is your reaction to the fanboy reaction over the whole Razor Lesbian reference? We knew it would cause a stir – let it stir. These were things that we had already established between the characters. This really influenced how they reacted to each other. The lesbian angle was fresh territory and an attractive component. 9) Last year I listened to your post show Podcasts. What made you decide to do it and will you continue them this year as well? Depending on the strike, we will see where we are. I don’t do them until the week that they air. SciFi.Com approached me in the first season and asked me. I did it at home and sent them the disc. It became fun. For me it was the last act of producing the series. It’s usually the last time I see it – the final act of completion. I can look at it and see what we were trying to do. 10) How much leeway does Sci-Fi give you in terms of your schedule and the content of the show? They give me quite a bit of leeway. They have opinions and notes. Most of the major battles were fought early on in the first season, but they let me do the show that I wanted to do. I cannot say that they did not let me do the show I wanted to do. 11) Do you have anything special planned for the upcoming DVD and high-def releases of BSG? They have been putting together the box set for season three. There is a very long extended episode of “Unfinished Business” – 70 minutes long. The editor and I did a commentary track for it. That was the biggest editing challenge of the third season. 12) I checked out the BSG game on X-Box Live arcade last week and I’ll be honest, I wasn’t very happy with it. How much involvement did you have in it? They never even show them to me. I was appalled to see that it was lambasted in the reviews. I made my displeasure known, and the word got out. There should be a closer consultation in the future. Historically, merchandising, licensing and games were all spun off into different divisions. The companies are trying to integrate them more into the process, but typically, the divisions don’t talk to one another and go off and do their own thing. There is still a lot inertia. 13) I was at GDC a few years ago for your well received keynote about Games and Film. Rumors started going around that you were going to do something within the game industry, perhaps a BSG Next Gen Game, but those rumors quickly died. What are your current thoughts on the Video Game Industry? I met a lot of people and had conversations, but nothing tangible came of it. They were more about new projects, and it still interests me, but I haven’t been able to focus on it. 14) I talked with Jason Behr a few months ago and apparently there have been some initial movement on a possible Roswell reunion do you know anything about it? This is the first I’ve heard of it. I haven’t spoken to the Roswell cast. I saw Katherine Heigl after Gray’s Anatomy hit. Other than her, I haven’t seen any of them. 15) What do you think about web video and do you have any plans for the medium? We did a webisode last year, but they have been tabled. That’s one of the key issues of the strike. We have said no because none of it has been covered by the Guild. At this point, once the strike is settled, I don’t know that there will be time or appetite to get web content running before the end of the series. 16) When NBC Universal makes a move like abandoning iTunes, do they consult with producers like you, whose show was a consistent top seller on that platform? They did not, nor did they consult with me when they put it onto iTunes. To them, it’s a strange palace of secrets that they will not speak. Now you see why there’s a strike. This is a source of a great deal of argument. When I get a residuals check, it will say for DVD. Somewhere in that sum is buried what they are saying for iTunes. There is no record of how many units it reflects. It’s Hollywood creative accounting. 17) Do you think you’ll pull a Joss Whedon and continue BSG in Comic Book form? 18) What’s next for you after BSG? 19) What do you think of what you’ve accomplished with BSG for sci fi on TV? Space opera sci fi is still a tough sell on TV. There aren’t many proven successes beyond Star Trek. You have to go to Babylon 5. Beyond that, it’s dicey. It’s a tough thing to sell. The form got caught up in clichés and bad storytelling. It started to undercut its own fanbase. We tried to reinvent the form and reinvigorate it. I hope that others can take advantage of what we tried to do. 20) How do you feel about the general state of the genre? There is a big appetite for horror/fantasy/science fiction on the part of the public. There always has been and always will be. But you have to do it right. There is a cynicism that gets applied to this genre very easily.